Regardless of whether you wear suits on a daily basis, you probably wear a few shirts relatively frequently. However, have you taken the time to stop and think about them? Most of us probably don’t give them much thought. Even if we take the time to choose the right shirt for the occasion, we usually grab the most suitable one at the best price. This is understandable, as the modern world has us pressed for time like never before. Still, it’s important to give strong consideration to the shirts you wear. They have a large say in the formality of your outfit and they bring it all together. In this guide, we’ll be taking a closer look at shirts and how to find the right one for you. See All Our Suits Content! This particular page deals with all general aspects of men’s dress shirts. If you have fifteen to twenty minutes to yourself, you can read it from start to finish. Improve your shirt game. Our guide will tell you everything you need to know about dress shirts! 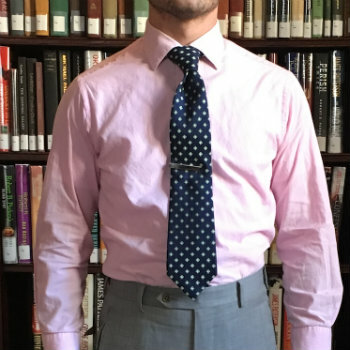 Dress Shirt Guide Reviewed by Charles-Philippe Bowles on January 24th . It’s said that shirts first got their collars around the year 1300. They were built into the shirts themselves and came up as high as the jaw and opened outwardly in a riffled pattern. As you might imagine, this was excess cloth at the time. Given its expense and lack of utility outside the battlefield, it was mostly worn by noblemen but was also built into soldiers’ armor at the time. Up through the nineteenth century, white linen dress shirts were considered to be the epitome of male elegance. All shirts at the time were made from linen, and this term has carried over into the tailoring world. For example, it’s important to show “half an inch of linen” below your jacket sleeve when suited. This is also where we get the term “white collar” from, which denotes upper-management workers, C-level executives, and the like: they could afford to wear white collars (and cuffs) because they didn’t dirty them by doing manual labor. At a time when most of the population lived in poverty, wearing white indicated success, a “good” family background, and gentility. White Collars & White Cuffs? Why? Having worn shirts yourself, you’ve probably learned that collars and cuffs tend to be the first parts of a shirt to show wear and eventually break down, while the body of the shirt could last nearly forever. It used to be that shirt collars were detachable, or “to attach.” This made laundering the most worn areas easy and helped further maintain the lifespan of the shirt’s body as it didn’t get over-laundered. It wasn’t until the early twentieth century that shirt collars were attached to their shirts as they are nowadays. Since white goes with any color, it made sense to have shirts with white collars and white cuffs, as these could be easily replaced when old ones became worn out. Nowadays, non-white shirts are sold with white collars and cuffs, as it has become its own particular look. One way you can buy shirts with collars and cuffs that can be replaced is to purchase custom-made ones. When a clothier has your measurements on file, they can simply order new collars and cuffs in your exact measurements and put new ones on. Simple! Alternatively, those with smaller budgets or vintage tastes can consider purchasing collarless tunic shirts often used by priests or barristers in the UK. While hard to find some traditional shirt retailers will offer them. Detachable or “Stiff collars” can then be purchased separately from online stores such as Darcy Clothing. As we mentioned above, shirts play a large role in determining the formality or informality of a given outfit. Generally, this boils down to collars and cuffs. First, collars‘ formality is determined by two main factors: its firmness and its degree of “spread,” or distance between the collar points. Firmer collars are more formal than softer ones, and wider spread collars are more formal than those with minimal spread (sometimes referred to as a “point” collar). Second, color is a formality indicator. There’s a reason that we wear white shirts with black or white-tie ensembles: white is the most formal color for shirts. This also applies in the worlds of business and government. We wear white shirts to job interviews, and it’s rare that we see a sitting President in anything but a white shirt. As shirt colors get darker, they get incrementally more casual. 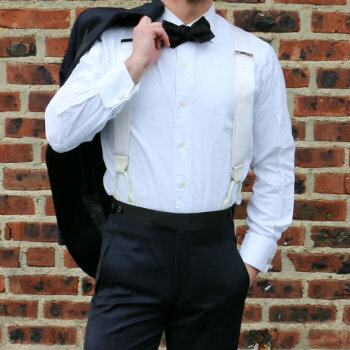 Third, cuffs indicate formality or a lack thereof. A barrel cuff is not necessarily casual per se (you can wear one with a suit, after all), but cuffs that require cufflinks -single and double- are definitely more formal. The single cuff wing collar shirt in white is exclusive to white tie and is thus the most formal shirt of all. Clothing being an art as much as it is a science, it’s important to remember that a shirt is the sum of its parts, which don’t exist in a vacuum. A brightly colored, boldly patterned shirt is casual, but if you throw a spread collar and double cuffs on it, you increase the formality. Conversely, a plain white shirt would typically be quite formal until you slap a button-down collar and two-button barrel cuffs on it. All men’s dress shirts have two major components: collars and cuffs. There’s quite a bit to discuss as it relates to shirt collars, including how to make collars work with your face shape (you can identify yours with our face shape guide). To that end, we’ve created a guide to shirt collars that we invite you to take a look at. Like collars, there’s much to know about shirt cuffs. As such, we created a separate page on dress shirt cuffs with all the information you need. How Do Dress Shirt Sizes Work? You’ve probably seen terms like Slim Fit, Athletic Cut, and Tailored Fit in addition to S, M, L, XL, and even numerical measurements. It’s confusing, and there’s good news and bad news as it relates to this. We’ll start with the bad news. The bad news is that there’s not a whole lot of standardization around men’s shirt sizing outside of using actual numerical measurements. The good news is that we can help you navigate this minefield. Note that all the information below is specifically for for off-the-rack shirts. When buying made-to-measure shirts, about 15 measurements will be taken off of your body and used to construct a shirt that fits perfectly. Seeing as not all of us have a tailor nearby to do this, we’ve included the info below to help you as you shop in a store or online. The upside to this system is that numbers are numbers, and if you know that your neck measures at 15.5″, you can pick up a 15.5″ collar shirt and know it will fit. The downside is that our arms don’t necessarily get longer as our necks get larger, nor do our bodies enlarge. If you’re a man like Henry Rollins who has a massive neck but average length arms, you’re going to end up buying a shirt that fits your collar but has arms that need shortening and a body that needs darts. Your tailor will love you, but you’ll be quite inconvenienced. Many low-to-mid-tier retailers will sell dress shirts sized like t-shirts or sweaters: Small, Medium, Large, Extra Large, and so on. Any brand’s website will often provide a sizing guide wherein these sizes correspond to collar, sleeve, and even chest sizes. This is great if you’re loyal to one brand whose shirts you love. However, there’s literally no standardization for this across brands, and while you might be a Medium at XYZ store, you could easily be a large at ABC Company. This person’s right shoulder slopes more than his left. The two terms that we find most useful are Tall (meaning that body and sleeve length have been increased for a given size, but not the overall body size) and Athletic (chest and shoulders are cut larger, but waist is still tapered). To make things even more confusing, some brands use entirely arbitrary terms in lieu of words that might actually describe how a shirt fit. Though they frequently change, J.Crew has a “Ludlow” and “Crosby” fit, and Banana Republic has a “Camden” and “Grant” fit as of this writing. There is, however, a benefit to all this, which is that you can use your body type to guide you in terms of which cuts will work for you and which ones won’t. First, if you don’t know your body type, take a minute and determine yours using our body type guide. If, for example, you’re tall and thin, look for brands that offer tall sizes for shirts. 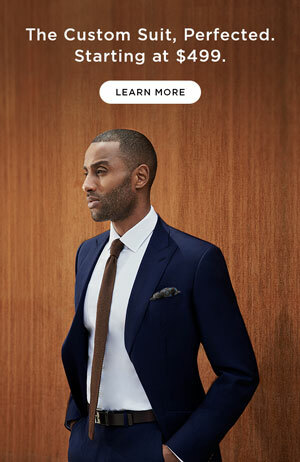 However, if you’re a thin guy, you’re going to want to see the words “Tailored” or “Slim” in the cut of your shirts. Otherwise, heavier guys should consider adjectives like “Standard,” “Classic,” or “Traditional”. 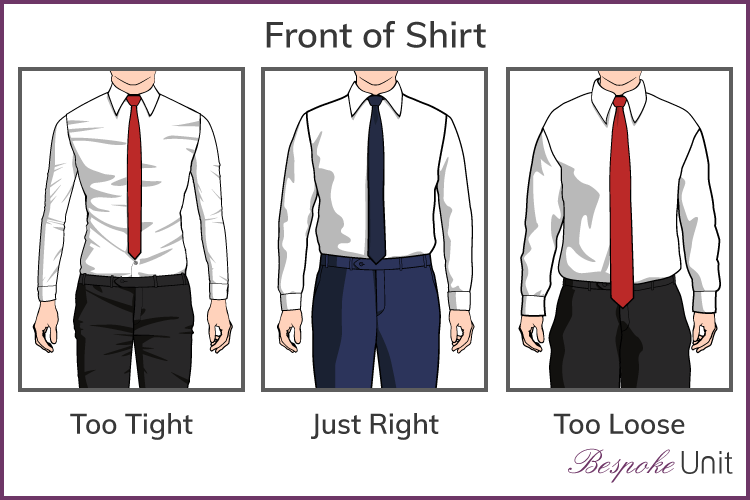 Regardless of how you buy a shirt or what size the tag says it is, there are five main components to dress shirt fit: body size, body length, collar, sleeves, and cuffs. For an in-depth analysis of proper shirt fit complete with custom graphics, we invite you to see our page on shirt fit. Body is trim, but not tight. Shoulder lines sync closely with your own shoulders. Two fingers fit between the collar and your neck. Sleeves finish at the break of your wrist with a bit of extra material to prevent it from pulling up on an outstretched arm. Cuffs are neither cinched at the wrist nor so big that they fall onto the hand. Tail length hits approximately at mid-crotch. As with anything in life, there are varying levels of quality in men’s dress shirts. We advise you to buy the best quality you can afford, but that’s a meaningless statement if you don’t know how to spot quality. Below, we go over the main factors that determine the quality of a men’s dress shirt. Proper dress shirts -ones that we wear to work and to social functions- are made from cotton. Therefore, it stands to reason that a shirt’s quality is directly linked to the quality of the cotton from which it’s made. We determine cotton’s quality, in large part, by its thread count. So, how does thread count work? In a nutshell, thread count simply refers to threads per square inch. The higher the number, the more threads per square inch a shirt has. The number of threads per square inch can only increase if the individual cotton fibers are finer, so a good rule of thumb is that higher thread count shirts tend to be better. They’re often more wrinkle-resistant and longer-lasting than shirts with a lower thread count, and their hand feel is often superior. Still, thread count isn’t super helpful if the cotton isn’t great to begin with. This is where style becomes more art than science, and you have to rely on your hands. Touch the fabric. Does it feel nice? Then it’s probably a good-quality cotton. Some shirts will have other materials in their fabrication, most often to add a bit of stretchiness to slimmer fitting models. If your shirt is, say, 97% cotton and 3% Lycra or Spandex, this is generally fine and won’t affect the long-term performance or wear of the shirt. Shirts that are 50% cotton and 50% polyester, though, should be avoided. While the price tag is enticing, these shirts don’t breathe well, don’t wash well, and don’t last long. Inexpensive is one thing, cheap is quite another. We’ll go over some step-by-step instructions for all of this below. There are a few ways to wash a dress shirt: wash & press at the cleaners, dry cleaning, and washing it yourself. Note that if you outsource your shirt cleaning, don’t have them starched. The shirts will look crisp, but starching will decrease their lifespan. It seems almost silly to take your shirts to a cleaner to have them throw it in a washing machine just like you would. The big selling point here, though, is that the cleaners will also press the damp-from-the-wash shirt for you, effectively ironing it and drying it at the same time. Most cleaners will do this for less than $2 per shirt, which is great. The only downside is that the pressing machines aren’t necessarily elegant and can break buttons with relative ease. A more expensive way to clean a shirt (typically about $5 per shirt), dry cleaning is good for oil stains and other issues that can’t be resolved by a simple wash.
No matter how well we care for our shirts, it always seems that the insides of collars and cuffs get this yellow-ish dirt ring that’s really difficult to get out. This occurs because these parts of the shirt make the most constant contact with the skin. The issue gets more pronounced the darker one’s skin gets, and our due condolences go out to our darker-skinned readers. Yellowing at the armpits happens as a result of the chemicals in the deodorants most of us use, namely aluminum, mixed with sweat. The only way to slow this process down is to launder your shirts regularly and in careful accordance with the care instructions on the tag. Pour yourself a glass of champagne, as there’s no reason we can’t be civilized about this. Depending on the number of shirts you need to iron, you may want to keep the whole bottle handy. Get your iron and ironing board ready. Unbutton all buttons and remove collar stays. 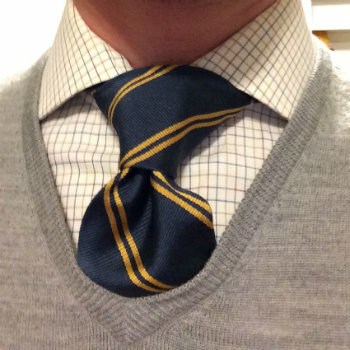 Start by ironing the moist collar by unfolding it and starting with the underside. Slowly press the iron from one side to the other, then flip the shirt over and repeat the process on the other side of the collar. Press any wrinkles toward the bottom of the collar where they’ll be least visible. Iron the cuffs, starting with the inside and moving to the outside. Press wrinkles to the edges if needed. Iron the shirt front, starting with the button placket. Use the iron’s point to get in between the buttons, then go back to the shoulder area and work your way down to the shirt’s tail. Repeat this on the other side. Iron the back by laying the shirt flat on the board. Rotate the shirt as necessary to ensure each area is ironed. Iron the sleeves. This is the trickiest part. You’ll want to ensure that seams on top and bottom are lined up, which will minimize incidents of you ironing wrinkles into the shirt. After lining up the seams, lay the sleeve flat and slowly work your way from shoulder to wrist. Repeat on other sleeve when complete. They should be hung on wooden hangers that are approximately 1″ wide. No wire hangers or cheap plastic numbers, as these can warp your shirts’ shoulders. Don’t stuff them onto a hanging bar. Not giving your shirts (or any hanging clothes, for that matter) any room to breathe is a surefire way to re-wrinkle them. It’s also just plain frustrating to struggle to get a shirt out of your closet when it’s packed to the gills. If your wardrobe is busting at the seams, it’s time to look into closet organization solutions or sell/donate/throw away anything you haven’t worn in a year. After laundering and ironing, button the shirt. You can alternate placket buttons, but make sure that at least the collar, middle, and bottom buttons are buttoned. Lay the shirt flat with buttons facing down (back facing you). Fold the sleeves to the middle of the back. Take both sleeves one-by-one and fold it over the back horizontally. Cuffs should cross over the middle of the back, and be sure to not fold in the shirt’s side seams. Fold both sleeves in again, this time bringing the shirt’s side seams in to the center of the back. Fold the shirt in half lengthwise. Take the bottom of the shirt with both hands and fold it up over the sleeves, ending just beneath the back of the collar. It may be helpful to tuck the bottom inch or two of the shirt’s tail underneath itself to save some space. Obviously, everyone needs shirts. As with any article of clothing, you have to consider a range of factors when deciding whether or not certain styles make sense for you. Such factors are your face shape, body type, coloring, and age are important, and each of the preceding links will take you to a comprehensive guide for those concepts. Where you work and how/where you play are also important to think about. If you work in a conservative law office, you’ll want to have a stable of white and blue shirts in your rotation, all of which are simple spread collars. If you’re a day-drinking brunch kind of guy, then it would behoove you to own a couple of more colorful casual shirts. 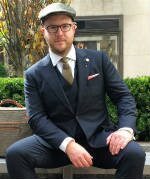 Paul is a the founder and creative director of Bespoke Unit. His interests range from: suits, shoes, watches, sport, and travel. See his full profile here, and read latest articles. I LOVE your Shoe/Trouser combination PDF. Was wondering if you also had one for Shirt/Trousers to complement it? If you could provide a PDF for this or even make some suggestions for the colours I’ve mentioned, that would be a great help in allowing me to expand my wardrobe options! We haven’t yet worked on a series of guides for matching shirts with trousers. As you can imagine, it could potentially get very complex as we start to include all the variables! Building a PDF for this would take some time, but I can offer a few suggestions! First of all, the white dress shirt is going to be your best friend – especially if you have a variety of trouser colours. It’s particularly handy as it gives you a crisp and clean appearance but also acts as a neutral colour, which won’t influence your choice of shoe leather. For the last two, try to really opt for very light shades that offer contrast against the trousers. These are actually quite tough colours to work with so I would personally only use white against these to play it safe. Hope this helps and answers your question!